Hello and welcome to my blog. 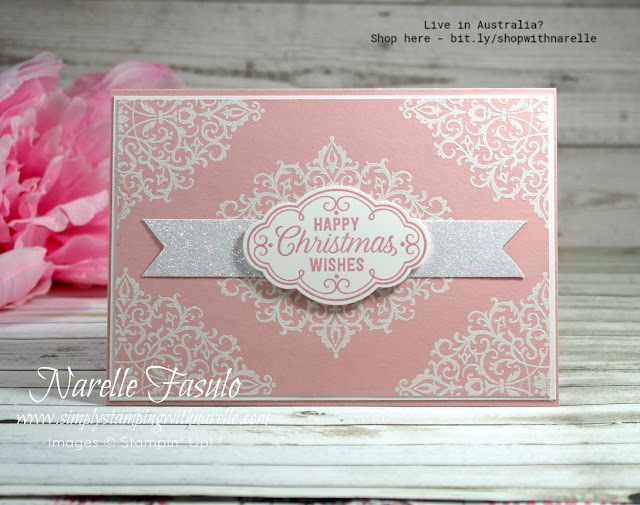 Today I have another card to share with you that uses the Flourish Filigree stamp set. It is actually a stepped up version of yesterdays card. This card is basically the same design as yesterdays card, but I have stepped it up by heat embossing in white. Instead of stamping the filigree stamp using Blushing Bride ink, I stamped in Versamark and then topped it with white embossing powder. I am still fascinated when that powder melts. The stamps are in the same design as yesterdays card. Besides the embossing, I have added a banner of Sparkle Glimmer Paper behind the sentiment. Just these subtle differences makes the card look different.